Far Cry 4 received a great reception from the press and gamers at this years E3 2014 games conference and corrects the problems that surfaced in Far Cry 3 gameplay mechanics. Far Cry 4 is the new upcoming first person open world shooter which has been developed predominantly by Ubisoft Montreal in conjunction with Ubisoft Red Storm, Ubisoft Toronto, Ubisoft Shanghai and Ubisoft Kiev. 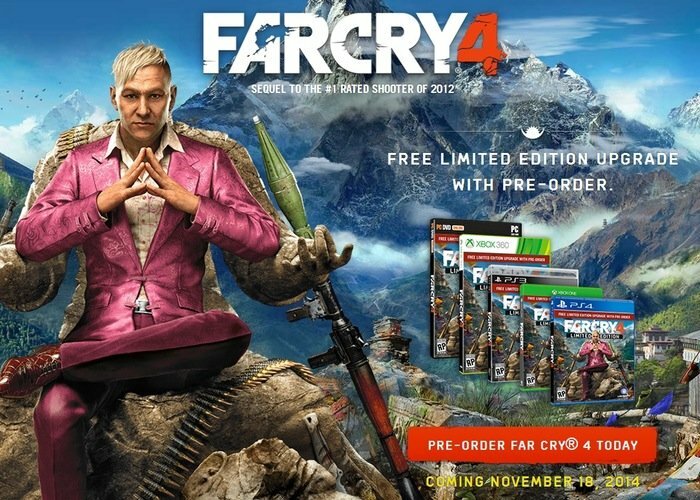 Once officially launched on November 18th 2014 Far Cry 4 will be available to play on PC and both next-generation PlayStation 4 and Xbox One consoles as well as the older Xbox 360 and PlayStation 3. During this years E3 games conference the first five minutes of the game were also unveiled, providing a good glimpse at what you can expect from the storyline and gameplay, check it out here.